I am working with the International Carwash Association® to share these tips. However, my opinions are entirely my own and I have not been paid to publish positive comments. In November, I said good-bye to my car. We bought it in 2006 and it came with me in my divorce. I drove it as long as I could because I liked not having a car payment. Then it started to cost me money and not just normal wear and tear expenses. Since moving to Ontario in June, it seemed like it was breaking down every month. It was $400 here and $600 there. In November, I’d had enough. The garage told me it would be $900 to fix it this time and I finally threw in the towel and said no. I wasn’t putting another dime into it and decided it was time to buy another. I was sick of always worrying about when it was going to break down next anyways. I ended up getting a great deal on a 2012 Toyota Rav4. Yes, I’ll have a car payment for the next three years, but at least I’m mobile again. I’m taking good care of it too. I want it to last for a long time and plan to drive this one till it dies too. I hope that is a very long time from now! Winter is a harsh time of year for vehicles and I’m taking extra steps to ensure my vehicle stays in tip-top shape over the next few months. I bought winter tires for it – a first for me. I’m a nervous winter driver so I feel better having them on my vehicle. 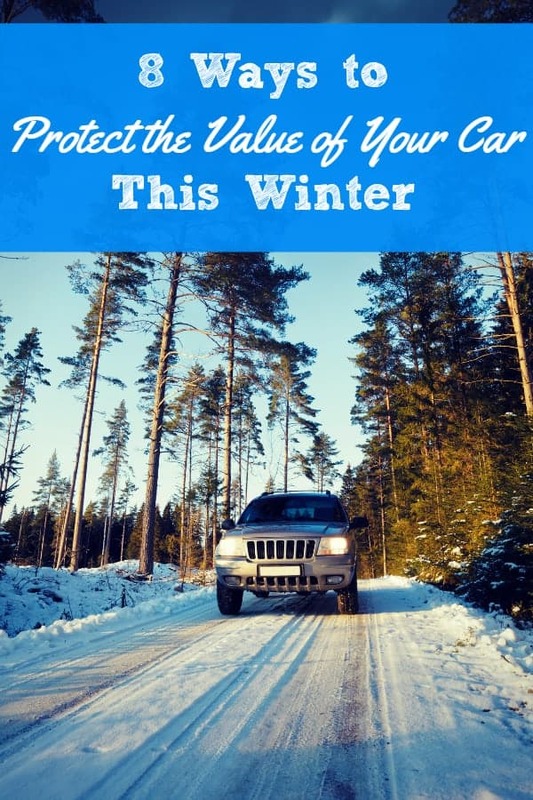 My friends at the International Carwash Association® (ICA) have some practical tips to help you protect the value of your vehicle this winter. Implement these tips for a safer ride in the short term and protect the its value in the long term. 1. Keep it clean. A clean car is your first line of defense this winter. Winter weather takes its toll on your vehicle and proper maintenance goes a long way protecting your investment. According to the International Carwash Association®, getting a new wash and a fresh coat of wax before the temperature plummets can be your first line of defense against ice, salt, sand and snow. Did you know that vehicular corrision occurs most quickly when temperatures rise and then fall below freezing? That is the reason why most auto manufacturers suggest getting your car washed and waxed at a professional car wash twice a month, especially during the winter. Use a WaterSavers® Car Wash to ensure your vehicle can handle the onslaught of winter – both inside and out. Plus, it also helps to protect the environment. A WaterSavers Car Wash typically uses only 40 gallons (151.5 litres) or less of fresh water per car per wash.
2. Rotate your tires. Most of us know about getting our oil changed every 3,000 miles (4,828 km), but many of us forget (me included) about rotating tires. Tires should be rotated before winter and then again every 6,000 miles (9,656 km). 3. Use winter-weight oil. It’s very important to keep on top of changing your oil and filter during the winter. If you live in a colder climate, consider using heavier, winter-weight oil during the colder months of the year. 4. Take care of your wiper blades. When snow starts to fall, your windshield wiper blades are your first defense. Make sure they are in good, working condition and replace them if you have your doubts. It’s better to find out NOW instead of being stuck in a storm and finding out your wiper blades just aren’t cutting it. Side note – I found out the hard way that my wiper blades were not working properly. It was on a slushy drive to Ottawa and my wipers would not clean my window. I ended up having to pull over on the highway and clean the window off with my bare hands and snow. Not fun and also very dangerous! 5. Take your car in for a tune-up. If you are noticing anything strange now (ie. noises, sluggish starts), the problem will only intensify as the temperature drops. Get your vehicle in for a tune-up as soon as possible so you can get any issues addressed. You don’t want to be breaking down on the side of the road in 40 below weather! 6. Check your power steering fluid every month. When you check it, make sure your vehicle is warmed up before you look. If the level looks low, look for leaks in the hoses or pump. Low power steering fluid makes your car more difficult to steer and you’ll want it to be in full working order when the roads get slick. Side note – My power steering was the last thing to go on my old car. I broke a sweat just trying to turn the car into my driveway. I would NOT want to be driving it in icy conditions. It would have been dangerous for me and others on the road. 7. Protect yourself from carbon monoxide. Carbon monoxide is deadly year round, but it’s even worse in the winter when you are driving with your windows closed. Have your exhaust system checked to make sure no leaks exist. 8. Make sure brakes are in good working order. In winter it can be even more difficult to stop quickly in slippery road conditions. Take your car in and make sure the brakes are ready for the winter season. Side note – we were rear ended by someone in the drive thru line at Tim Hortons. No one was hurt (car or people), but the guy who hit us had the worst excuse ever. His brakes weren’t working. Yep he really said that. Don’t be like this guy – make sure you and your family are safe and others on the road are too. As you can see, it is extremely important to take care of your vehicle in the winter months – more so than any other season. I’ve been giving my new vehicle lots of TLC and want it to last for a long time. Plus, I feel better knowing that I’ve done everything I can to make sure our family is safe. Visit WaterSavers to learn more about protecting the value of your vehicle. What do you do to prep your vehicle for winter? I learned that: WaterSavers® members must use an average of no more than 40 gallons (151.5 liters) of potable/fresh water per car in conveyor and in-bay/roll-over systems. I learned that there is a location just around the corner from me. They reclaim so much water. I didn’t realize that by washing my car I was polluting the environment. I learned that water entering storm drains, unlike water that enters sanitary sewers, does not undergo treatment before it is discharged. I learned that WaterSavers® car washes prevent water pollution by routing wash water to treatment prior to its return to the environment. It seems ridiculous to me now that I never realized that washing my car pollutes, not only the soil, but the animals in the rivers and streams. I feel terrible…. I found that their was a WaterSavers location less than 3 miles from me! I learned when washing your car, the chemicals wash down into the ground and water systems and pollutes. I’ve learned that when you wash your car on pavement, the rinse water runoff — along with all the chemicals it contains — can go to storm drains that empty directly into rivers and streams. I learned when you wash your car you pollute! They have a reclaim tank for their water. Cool! I learned that by washing my car it also pollutes the environment. I learned that the nearly 1,500 WaterSavers® car washes worldwide are committed to meeting strict criteria to help protect the environment. Learned that there are 3 Water Savers locations in my immediate area. I learned that water savers car washes prevent water pollution by routing wash water to treatment prior to its return to the environment. I learned washing your car pollutes the environment!! I learned that giving your car a good cleaning and fresh waxing helps to protect it against winter weather. WaterSavers is concerned about water pollution, water conservation and how to take action. I learned that if you use watersaver you help limit pollution. When cars are washed on streets, parking lots and driveways, that dirty water eventually winds up in rivers, streams and lakes. I learned washing my car pollutes. I learned that by reducing water pollution in our communities, we are protecting our streams, rivers and water tables. I learned that a lot of pollution rolls off the pavement from water runoff. I learned that they have over 1500 locations worldwide. I learned that WaterSavers® car washes prevent water pollution by routing wash water to treatment prior to its return to the environment. These car washes also use only 40 gallons (151.5 liters) or less of fresh water per car wash — less than the typical home washing machine. Thank You for the giveaway…Acid rain, road salt, bird droppings and sun damage are just some of the threats to your car’s condition that can be addressed by regular car care i.e. a regular schedule of washing the exterior and applying wax ! I learned that all the water that is used is either either recycled or returned to the environment cleanly. I learned that the closest place to me is almost 30 miles. 27.3 to be exact!! They use less than 40 gallons per car (which is MORE than we use in a washing machine?? EEK!). I learned that car washers who use water saves use less water and return it more cleanly afterwards. Water Savers offers fund-raising opportunities to encourage groups to avoid parking lot car washes. To earn the WaterSavers® designation, a car wash must meet standards to help prevent water pollution.